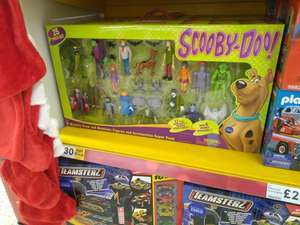 Children will have hours of fun recreating all their favourite Scooby Doo moments and episodes with this exciting Mystery Crew and Monsters set. With 17 fully articulated and posable action figures, including the Mystery Crew and some of the most iconic monsters, there will be plenty of scary stories to act out. The set also comes with 8 spooky accessories to bring children's play to life. Deal found at Tesco Extra in Ashby-de-la-Zouch, but likely to be a nationwide deal.